The positive final Markit services PMI has supported EUR. the US initial jobless claims along with the ADP employment change, ISM and Markit services PMIs will be the center of attentions. The support rests at 1.16030 with resistance at 1.16600 which the weekly pivot point at 1.16410 is located in between the lines. The EMA of 10 is moving with bullish bias in the horizontal channel and it is above the EMA of 200 and the EMA of 100. The RSI is falling towards the 50 level, the Stochastic is moving in high ranges and the MACD line is above the signal line in the positive territory. The ADX is not showing any clear signals. 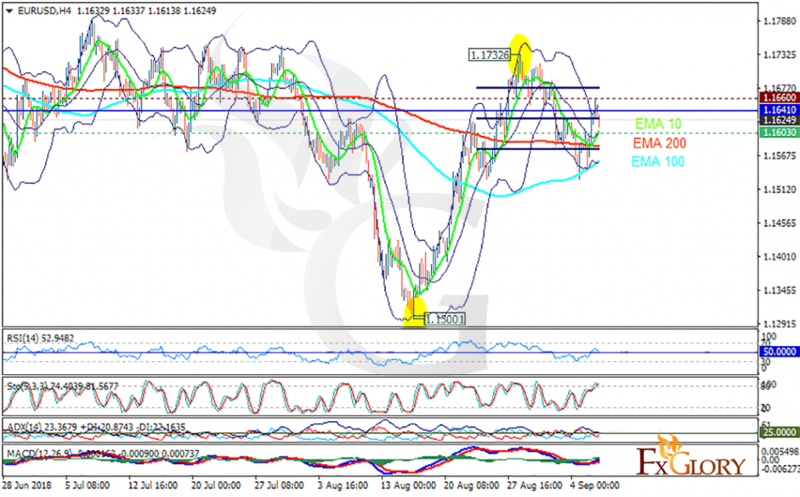 Most probably the price will be fluctuating within the Bollinger bands, however, the resistance level breakout may push the price higher towards 1.173.